Update: At some point, Omega renamed 8008C and 8007S to Omega 8006HDC and Omega 8006HDS respectively. For some reason, it retracted its decision. If you’ll visit the official Omega site, you won’t see the classic 8006 juicer but instead, you’ll find the Omega J8006HDS. Don’t be confused, I think here’s what’s happening. Omega couldn’t let go of the 8006 model because it’s their all-time best selling juicer. They need to somehow pass its legacy or maybe revenue. To sum it up if I’m referring to 8006 this is what it means. I’m planning to write new reviews on these newly baptized products but it doesn’t make sense now as it’s basically the same juicers that I’ve written about. Not only is the Omega 8006 Juicer a powerful, single gear, masticating juicer, but also it yields more juice than other juice extractors on the market, which means you ingest more vitamins, minerals, and enzymes. There is less foam to contend with and minimal heat friction. This 4th Generation Nutrition Center achieves this from a slowly rotating auger at the speed of 75 to 85 RPM resulting in less oxidation. This achieves healthier juice that can be stored for up to 72 hours in a tightly sealed container. The GE Ultem auger is eight times stronger than other augers and easily grinds up hard or soft items like wheatgrass, carrots, oranges, and much more. Additionally, this slow juicer is multi-functional which allows for more variety in your juicing routine. You can create nut butter, baby food, and pasta. You can even grind spices and your own coffee beans for a fresh cup of java. This juicing machine is built out of strong, durable materials with 110-120V and is also available in 220V/50-60Hz. This cold press juice extractor is a sibling to the Omega 8004 juicer. They share identical features except for their colors. The 8004 model comes in white making it more prone to staining, while 8006 stuns in a chrome finish. On top of that, the J8006 Nutrition Center is part of the Omega 8000 Series. There are very minimal differences between each model, so to help you decide I came up with this chart. Feeding Chute 1.5" 1.5" 1.5" 1.5" 1.5" 1.5"
Busy folks will love the fact that the juice resists deterioration and can be stored for up to 72 hours. The initial set up of the Omega 8006 juicer can be a tad confusing, but the parts are easy to assemble. It takes under a minute to put it together. Juicing requires a little preparation because the feeding chute measures 1.5 inches across. You will need to slice larger vegetables and fruit to fit them down the tube. Juicing is almost effortless. Use the plunger to push items down the chute as needed. Try not to put too much down the tube at once because you might clog it. The machine has a reverse function that unclogs it. If that doesn’t work, simply pull it apart, rinse and put it back together. After you finish, feel free to take the pulp and run it back through the juice extractor. This allows for maximum extraction. Not only is it easy to use, but it is also just as simple to clean. While the attachments are top rack dishwasher safe, it is better to clean the parts as soon as you finish using your home juicer. The buildup on the parts will harden, making them more difficult to clean off. Besides, it only takes a few minutes to wash and rinse off everything. Disassemble the electric juicer and rinse the parts before placing them in hot, soapy water. Use the cleaning brush to scrub the pulp that gets caught in the juicing screen and the sieve. This masticating juicer is effective at extracting juice slowly, reducing oxidation therein producing healthier juice. Store it up to 72 hours in the refrigerator. However, you should drink it as soon as you can. Not only will it taste better, but you will also absorb more nutrients. You see, as the juice sits, the nutrients begin to break down. This classic nutrition center excels beyond juicing. With the right accessories, it can be your very own food processor, homogenizer, pasta maker and coffee grinder. You can even grind your own coffee beans for a fresh cup of java with this machine. Some coffee beans (especially gourmet coffees) have higher oil content, this has to be dried overnight for easier processing. What Kinds of Produce Can the Omega 8006 Juice? This juice press can process soft and hard produce, leafy greens, citrus fruits, beans and nuts. Hard produce include sweet potato, asparagus, ginger, pear, coconut, cauliflower, celery, carrots, pepper, beets, garlic, pumpkin, cucumber, turmeric, watermelon, bitter gourd, fennel, broccoli, pineapple, cilantro, apple, and yakon. Green leafy vegetables such as spring onion, pine tree needles, kale, parsley, cabbage, brussels sprout, moringa, lettuce, beet greens, dandelion greens, romaine lettuce, spinach, wheatgrass, basil, peppermint and collard greens. Citrus fruits like lemon, orange, grapefruit, mandarin, lime and tangerine. Juicers are not made for soft fruits but if you’re thinking of making purée, that’s doable. Soft fruits such as avocado, blackberry, mango, pomegranate, grapes, strawberry, peach, melon, tomato, papaya, kiwifruit and cranberries can be turned into a purée but I’m not sure about the quality. Soft fruits are more ideal for making smoothies. This multipurpose juicer is a beast of a masticating juice extractor. In comparison to other juicers, it is relatively quiet as it gets the job done. I recommend placing a few paper towels or a thin hand towel under the machine to absorb the noise if it is still too loud. It has a powerful motor utilizing a dual stage masticating extraction process to yield impressive amounts of juice from any type of produce you put through it. This cold press juicer is worth the investment as its functions expand beyond juicing. It is dependable and grinds a multitude of items. 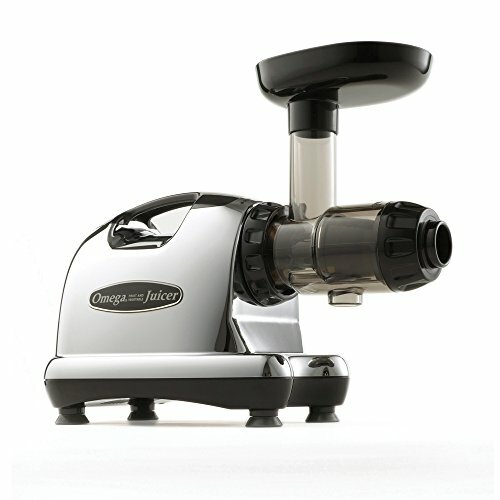 Backed with a 15-year warranty, easy to use and clean, any consumer would be completely satisfied with the Omega J8006 Juicer & Nutrition System. There’s no doubt why it’s the best selling masticating juicer.